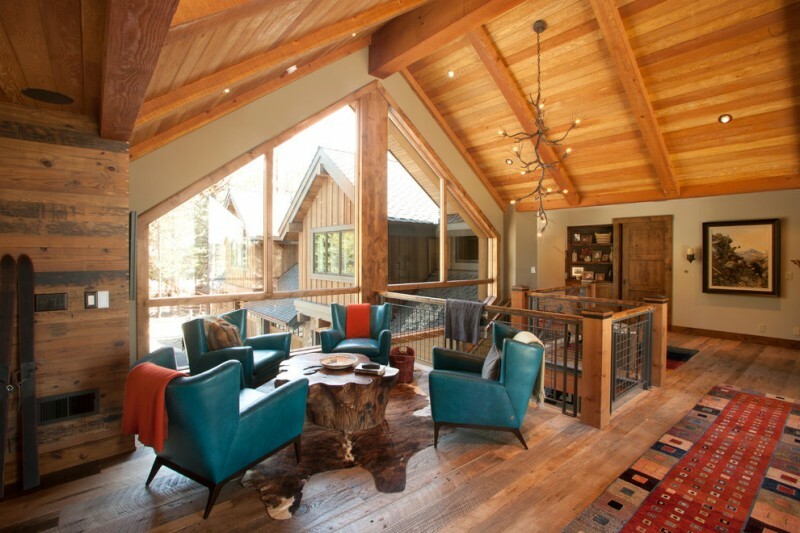 Wood is the most perfect material to add warmth, equilibrium, and elegance either for interior or exterior home design. It’s flexible to design in any styles starting from classic to contemporary. 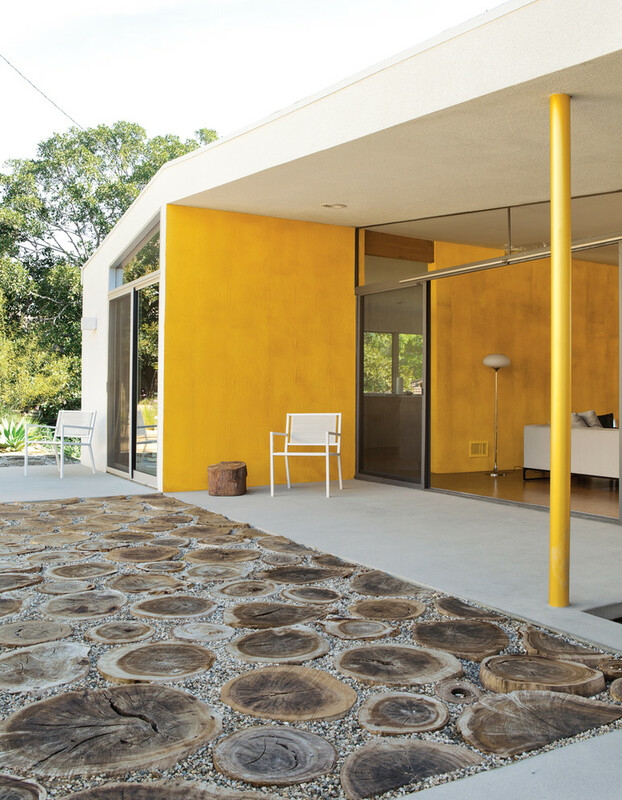 For years, people use it as the primary and basic material for furniture and house facade. 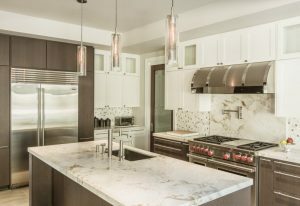 Wood can also be a perfect combination for other recent-used materials like acrylics, plastics, and other kinds of synthetic materials. Yet, most people today have a tendency of coming back to use something natural as good as their instincts and roots. Tree trunk tables are just few of popular furnishing pieces reflecting how urban people nowadays prefer raw material (like wood) than synthetic material for their choice of modern home design. This furniture is designed with multiple purposes: coffee tables, candle holder tables, side tables, and even gorgeous decorative tables for putting planters complete with their fresh greenery. Well, the followings are the most fascinating tree trunk table ideas for indoor-outdoor use. It is naturally decorative to use: four units of timber stools as a stunning coffee table in a contemporary living room. Their existence brings a perfection and natural warmth in the middle of modernity. 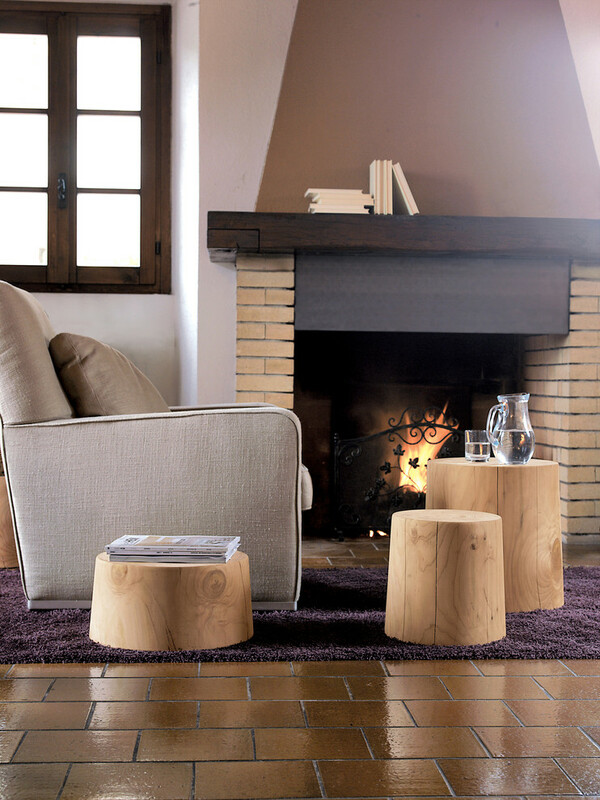 Soft and natural, two words depicting this tree trunk side table. Modern white and clean lines sofa reflects high-level modernity, and a coffee table with under bookshelf means practical application. 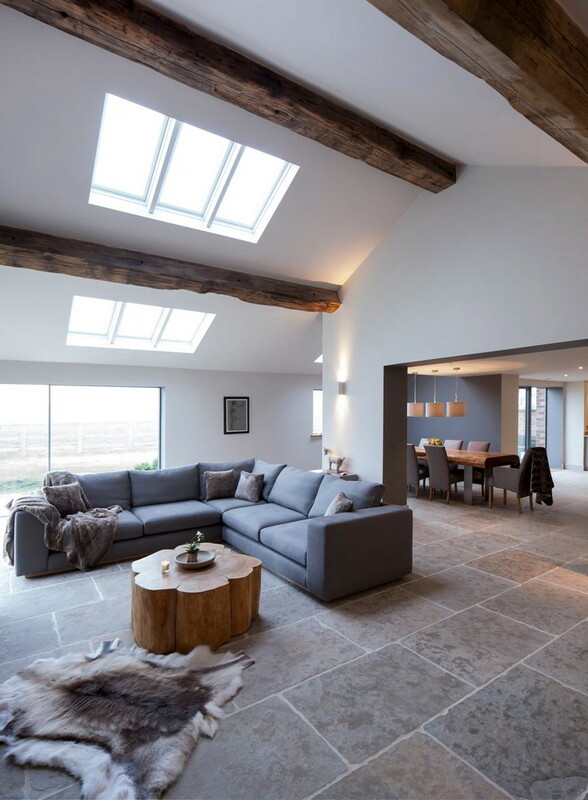 These modern values are easily discovered in this contemporary living room. Elegant and cozy patio furnished with updated furniture set. Here, you’ll found several timber stools covered with white and textured fabrics, giving clean and simple look. They are arranged in triangle formation and another is set as a side table. This idea is brilliant for saving space. This application also gives us a new idea to optimize another furniture item for another function. An organic coffee table in large size – it’s a real tree trunk coffee table which still exposes the natural value of a kind of wood specimen (texture, tone, and pattern). It’s unique when we combine it with modern living room like this L-shaped sectional accented with multicolored throw pillows. Also, contrast it with bright shag rug as the floor cover. 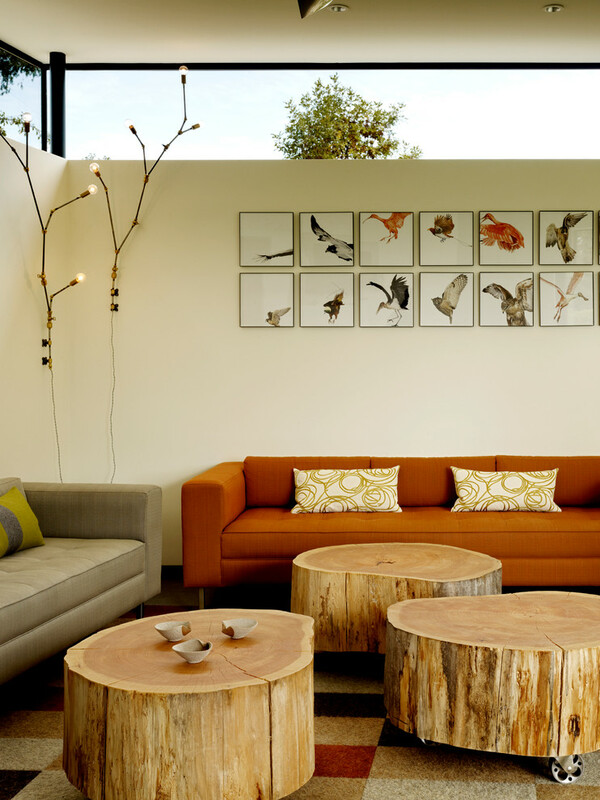 A group of tree trunk coffee tables – can be removed when needed. 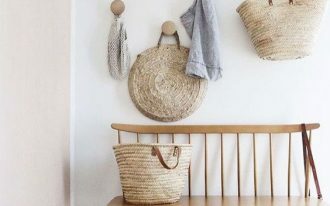 You can move one or two when you need a larger space for relaxing or welcoming your guests. This means, these numbers of coffee tables are used based on the need. The design, in another case, is softer but still keeps trees’ natural values. Natural values beyond dominant black interior. A contrast is created when black interior becomes a ‘media’ for a cluster of tree trunk tables. Overall, it’s dramatic and beautiful. A slice of half-cut tree trunk coffee table – be an inspiring idea for you who love something unique yet natural for your living room. The table really matches with the seats and slate floors, and gives a harmonious tone to beige interior. Deep blue-grey-brown tone dominates this living room. They obviously create an exotic, elegance, and even chill-feel when combined. Add bright red accent and get a dramatic look. Clear acrylic side tables as if tell us that both the synthetic material works well with the natural material like woods. The tables are different variant of most recent tree trunk table products designed in updated model. They are sustainable and formed in oval drum shape. Overall constructions are surfaced with oil finishing and made of best Oaks. They’re so recommended for both indoor and outdoor use. These three trunks tables are built in different height levels for different use. The highest one is ideal for a coffee table, while the lower ones are just the secondary uses like a side table or additional serve surface. 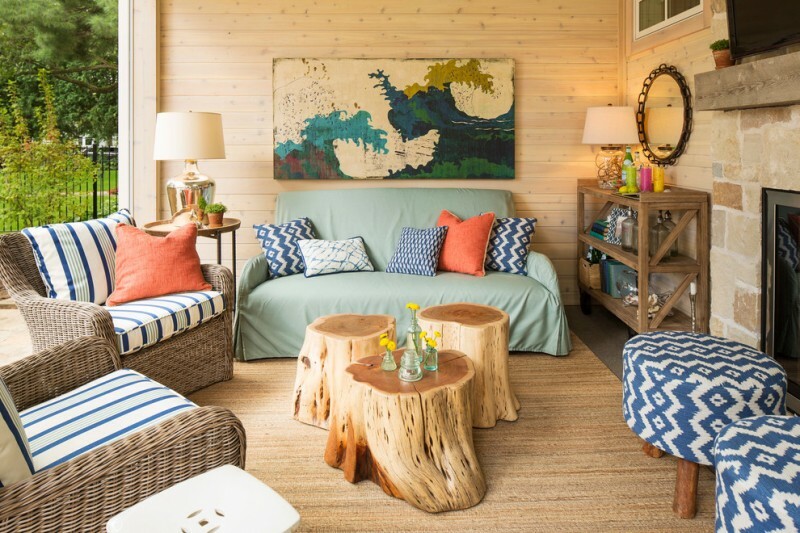 A beach patio with natural touch discovered in a tree trunk coffee table. Take a look at the table, top and base are built from the similar tree; both are designed for different purposes. It sounds so unique since such raw material is rarely used in a modern beach style patio. 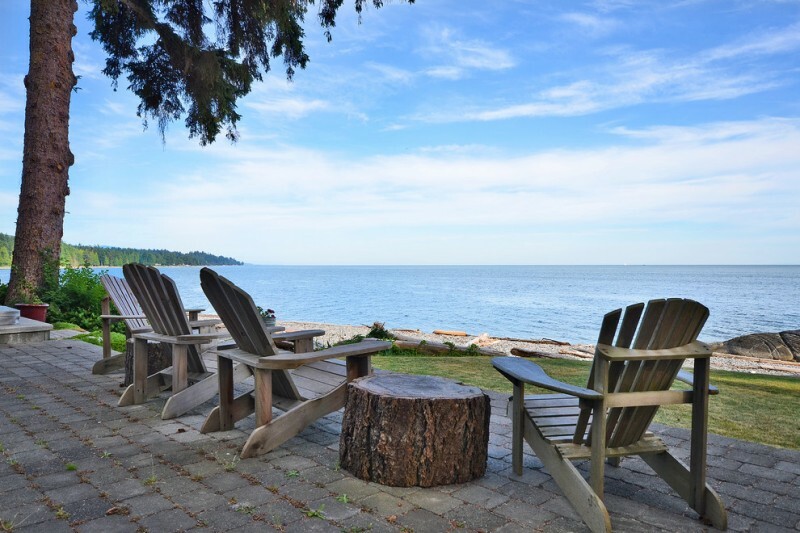 The designer seems want to expose more the balance of coastal-rustic in one application. A trio of modern tree trunk coffee tables with black iron base – The tables match with the interior’s main concept: black & white. The natural values are clearly presented by these fascinating tables. Different to other common tree trunk furnishing pieces, this coffee table is really unique. It’s made of horizontal-cut tree trunk with wood box base. The design is possible for more space to serve drinks and snacks. Large and flower-like tree trunk coffee table – The tone is quite natural, giving a contrast to a set of sectional sofa covered in modern grey. The exposed beams on ceilings remind us about a dock in ports. A loft style living room with deep turquoise mid-century modern chairs and dark-toned tree trunk coffee table. The table and floors are identical in color scheme, but not the slanted ceilings and railings’ frames. Yet, they’re still charming by highlighting each true color. 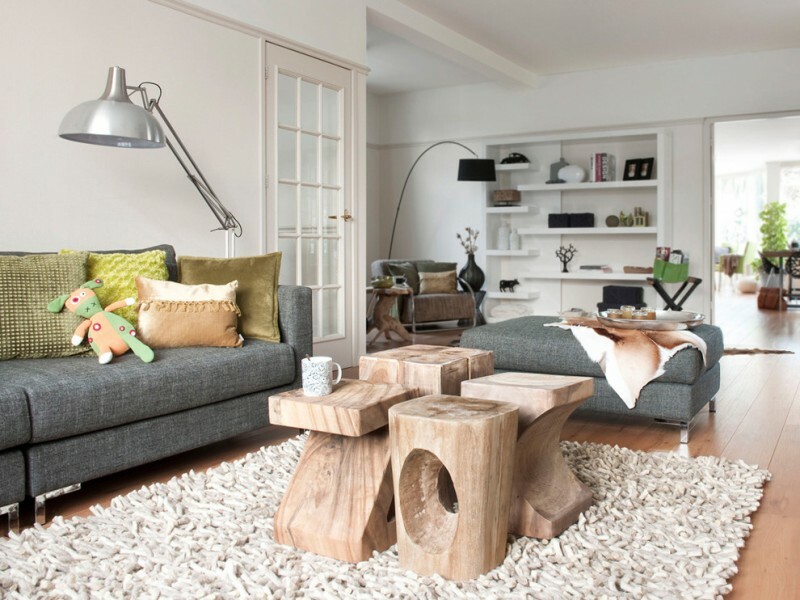 Three units of tree trunk coffee tables with different height level and pale tone – giving natural brightness to this living room. 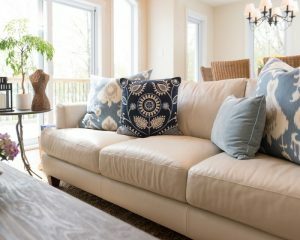 Their tone of color also adds a neutral scheme to pop-colored sectional sofa. 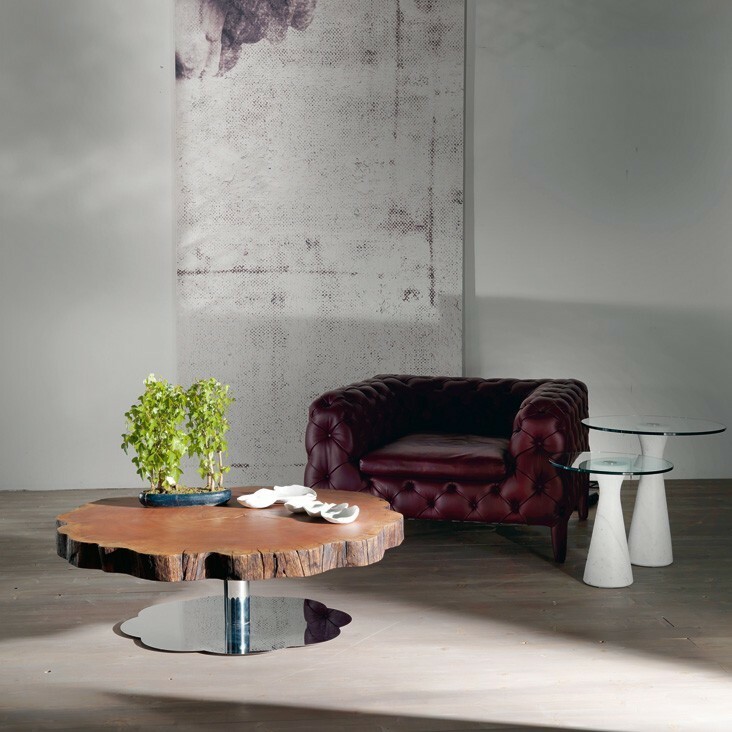 A tree-root coffee table with round glass top – an inspiring coffee table that highlights both synthetic and natural materials as one. The idea is quite interesting and nice to try. 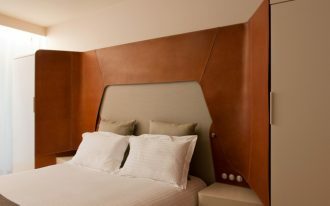 You can still emphasize the natural values of wood piece in the middle of modern interior design. All furniture sets are so unique in shape. The coffee table, for instance, is supported with hairpin style legs and asymmetric tree trunk top. It also has rather similar color to the rug, giving monotone and uninteresting spot to look at. 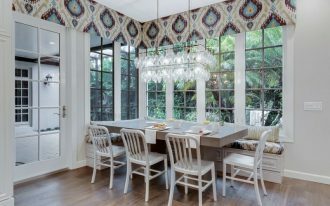 Mixing contemporary and traditional designs can be an architectural challenge. This furniture set describes powerful modern and traditional styles in one frame where each item balances each other. To create a beautiful contrast in your clean lines bedroom, it needs to add something stunning like this black doffs tree trunk bedside table. 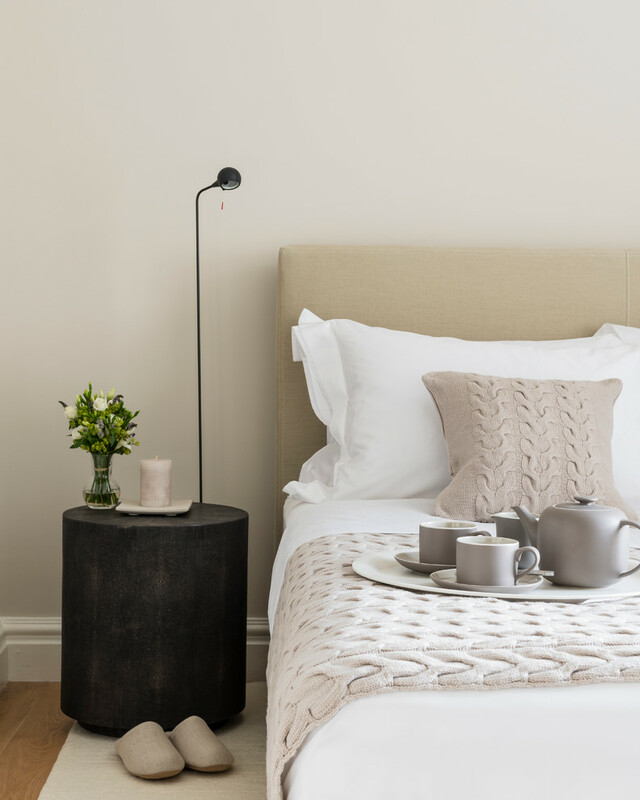 Put white candle holders for decorative purpose and match it with soft and neutral bedding treatment. It must be a fascinating spot for relaxing. A tree trunk side table among a couple of red floral lounge chairs. The chairs’ design is pretty unique and creative, complementing the natural look represented by the side table. A living room idea with a tree trunk side table – This package of living room set quite matches for a young family. 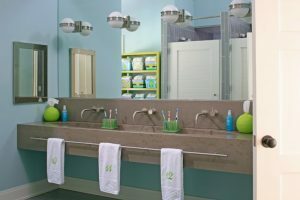 Turquoise accent and mid century modern furniture set make this room fresh and clean. 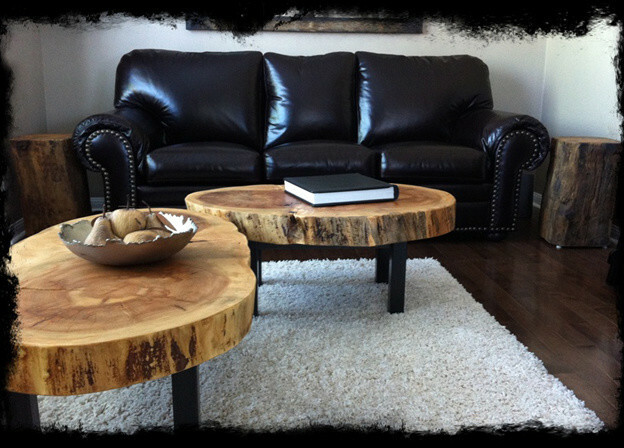 Large tree trunk coffee table without finishing gives the natural value to a contemporary living room. With distinctive texture and tone, the table gives a special look among this light interior. 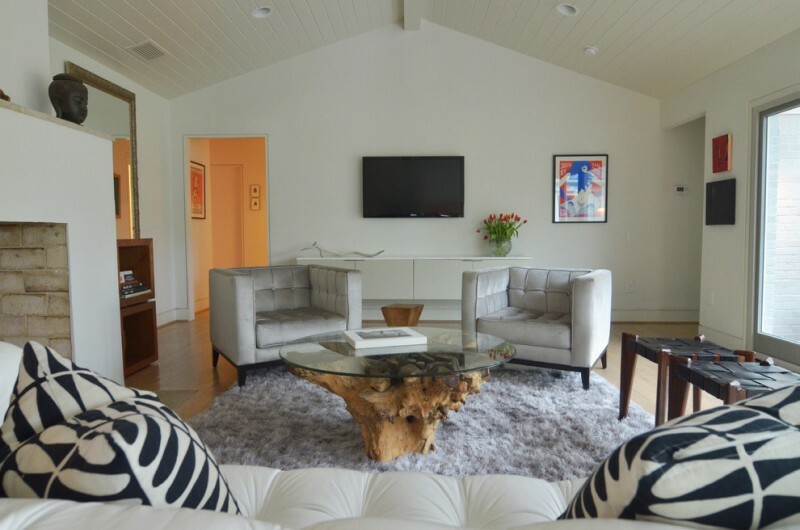 Including such a trunk tree coffee table is the easiest way to accomplish a rustic contemporary living room. 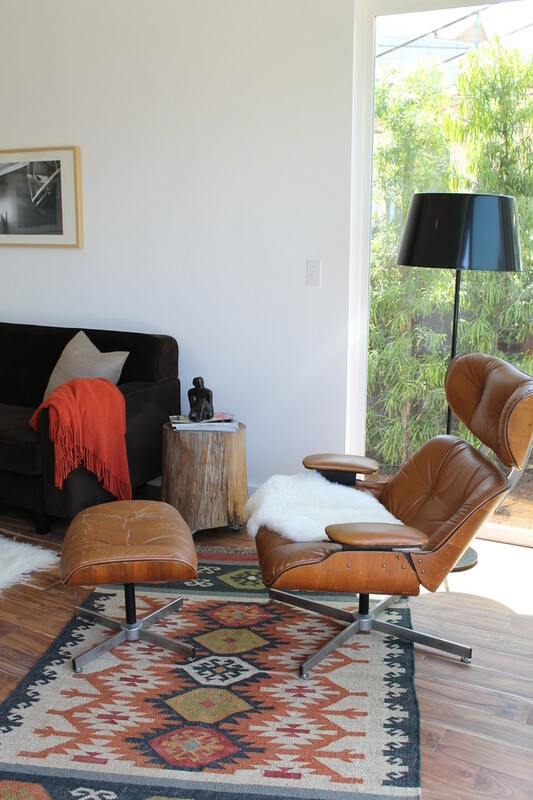 Match your furniture set with fluffy brown shag rug and feel the comfort. This furniture set is an inspiring package for an airy and simple white living room. 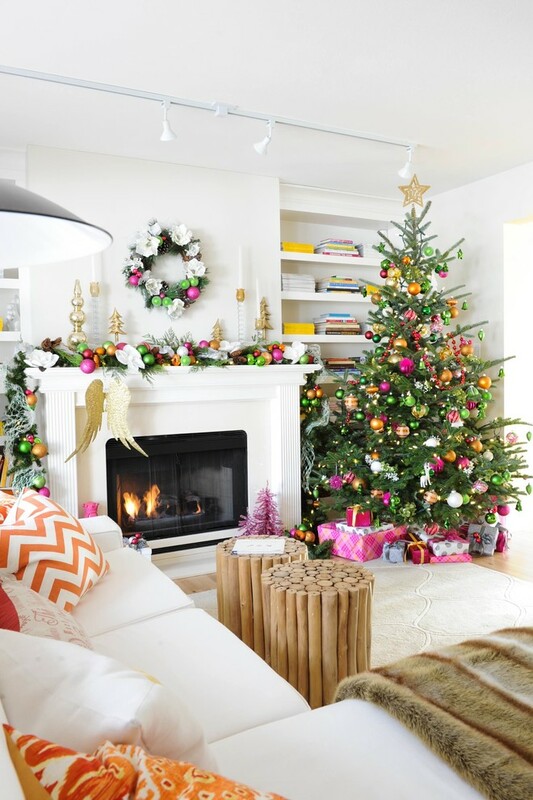 A couple of whitewashed tree trunk tables is included to provide more space for putting the ornaments, drinks, snacks, candle holders, and many other displayed stuffs. A log table or tree trunk table for putting the decorative plants; this is practical used just for a decorative purpose. Make yourself creative with building this amazing coffee table. You can use smaller logs and arrange them as a cluster of logs. Use timber glue to stick the logs on and make the base and top flat by cutting them off. For best result, please access a tutorial of making a creative logs furniture on the internet. That’s so challenging. An end table made of dark tree trunk. 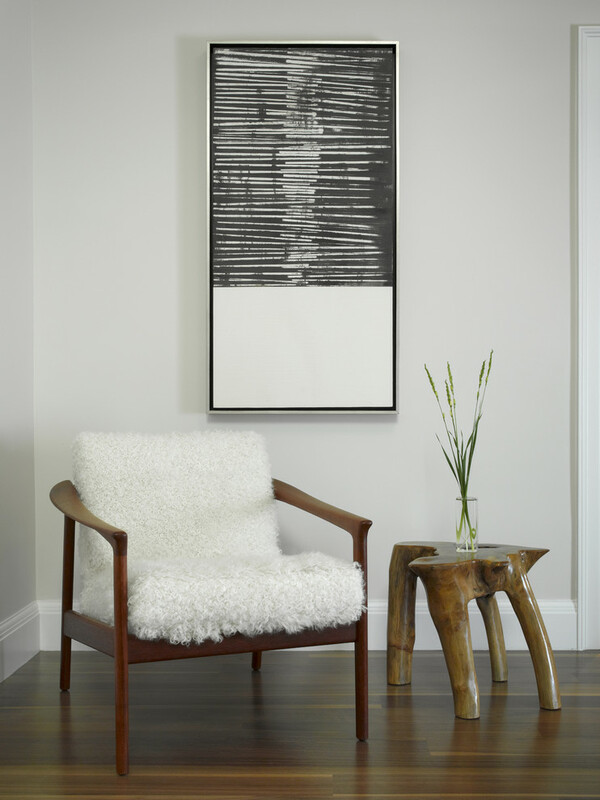 The chairs and side table are exposing the original tone and texture. 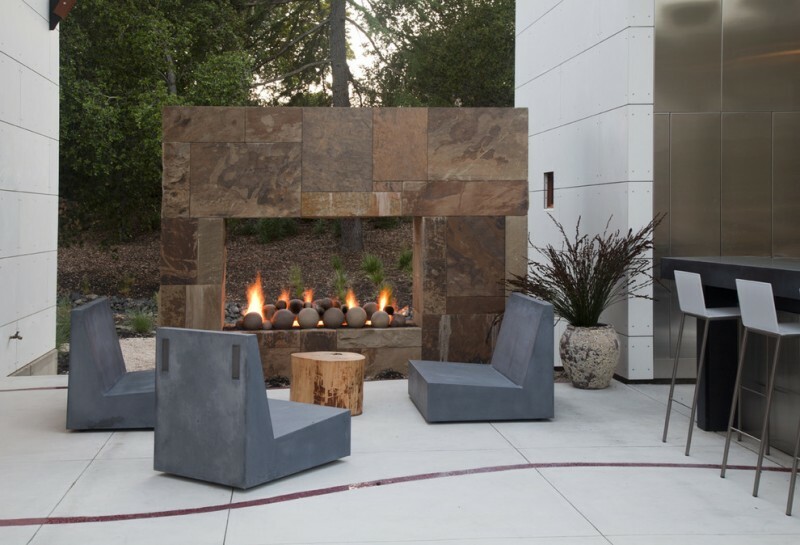 This package of outdoor furniture set quite blends to pavers and natural view surround. 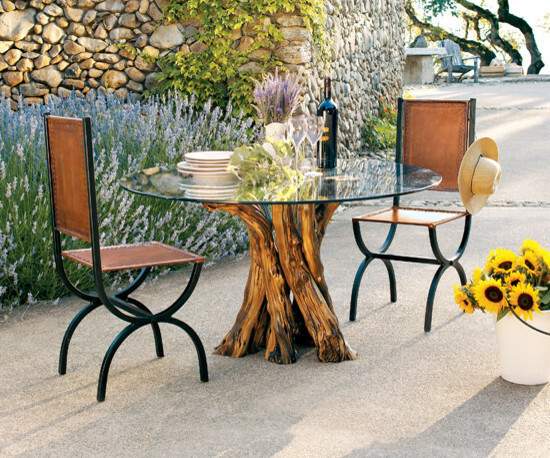 This is an example of a trio tree trunk coffee table for a Mediterranean patio. Actually, there is no difference of tree trunk applications for each type of interior style. What makes them different is how we mix and match them in a particular interior style. Whatever the styles are chosen, the designer will adapt and settle them on it. This rustic terrace is quite beautiful. 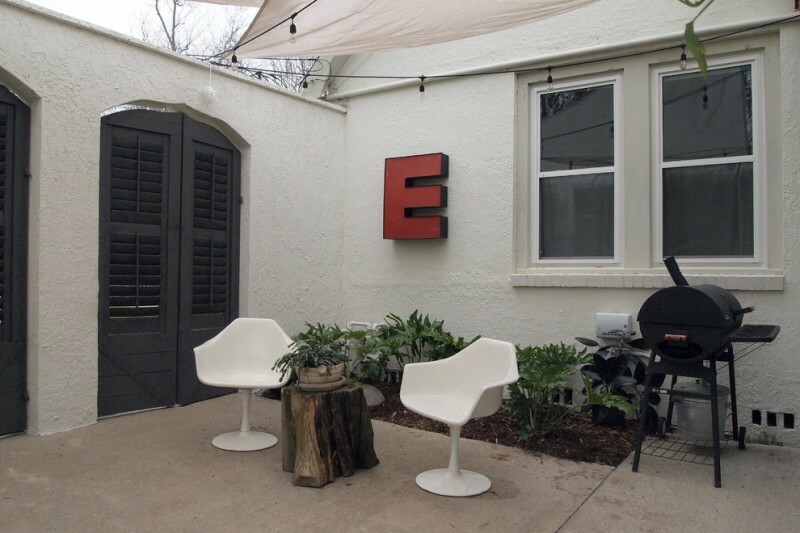 This space has an outdoor dining furniture set made of original woods. With a woodland theme, some units of tree trunk tables are set as the outdoor chairs and complemented with a round top table. 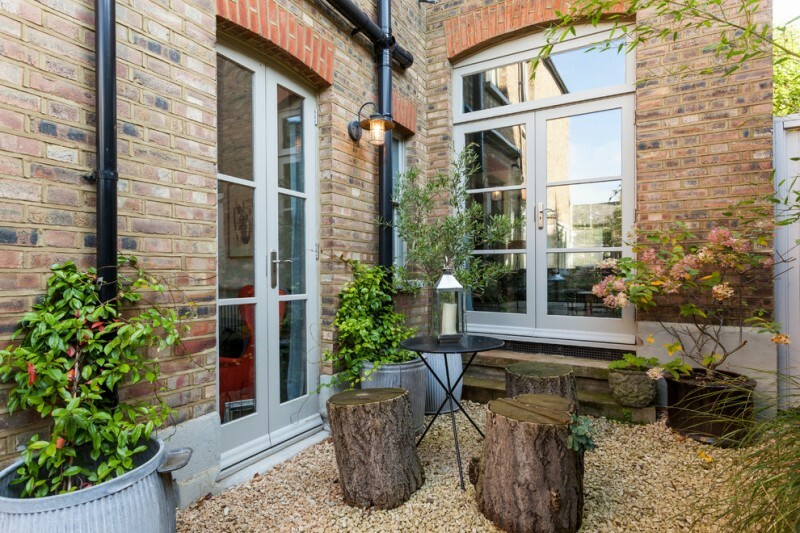 Some decorative plants are involved to create a real outdoor view. Tree trunks tables can also have another function: as stools. Here, we’ve found a pair of stools and table made of tree trunks covered with clear finishing. Use wood-colored rug as the floor base and feature it with soft turquoise chair slipcover. 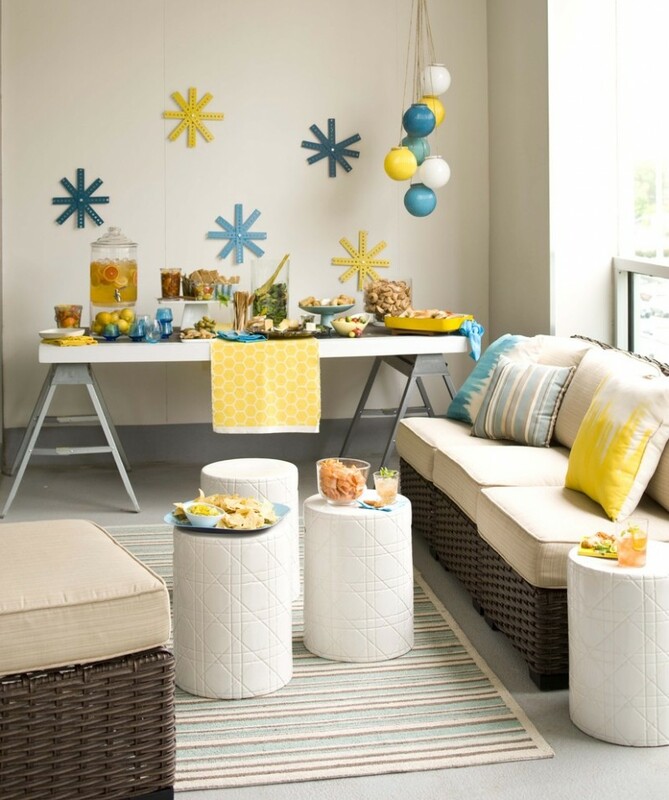 Pop colored pillows and ottoman chairs are enough to create a playful tone in this screened patio. 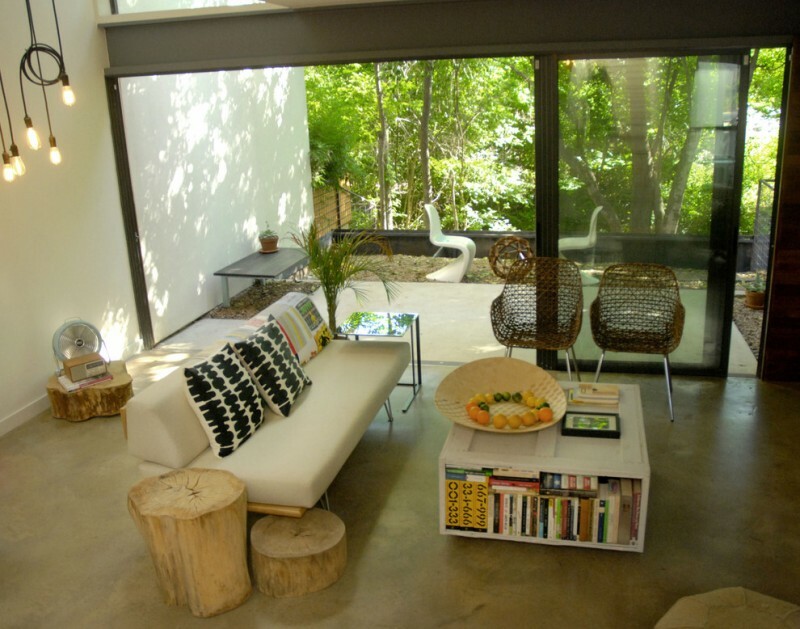 Simple and minimalist idea of tree trunk side chair application in a mid century modern patio. 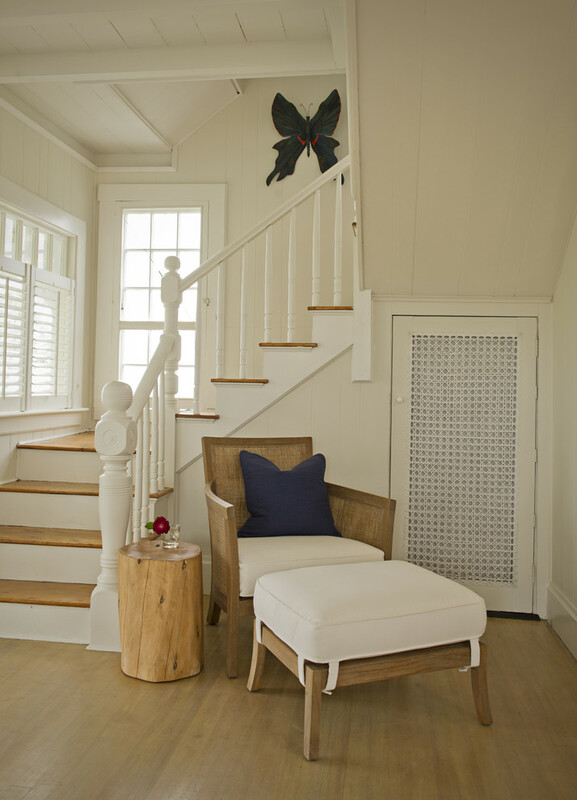 The space just has white single chair and smaller tree trunk side table; a couple that makes this space so perfect. 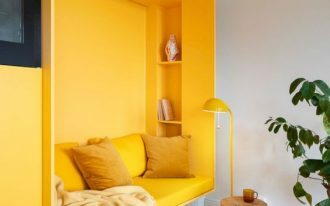 The colors are so stunning with deep yellow walls as their background. 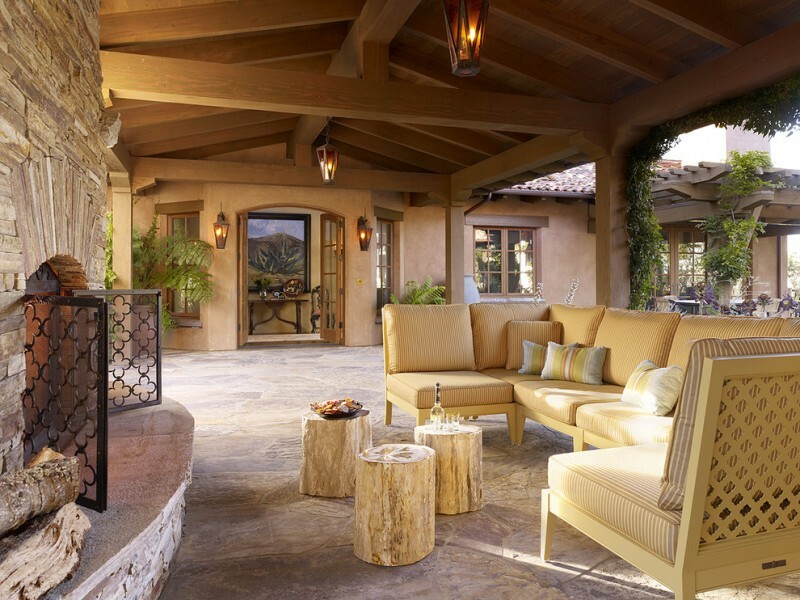 A rustic patio idea with square-shaped tree trunk center tables. The tables are kept in original and the designer just adds black line in the middle as the ornamental accent. 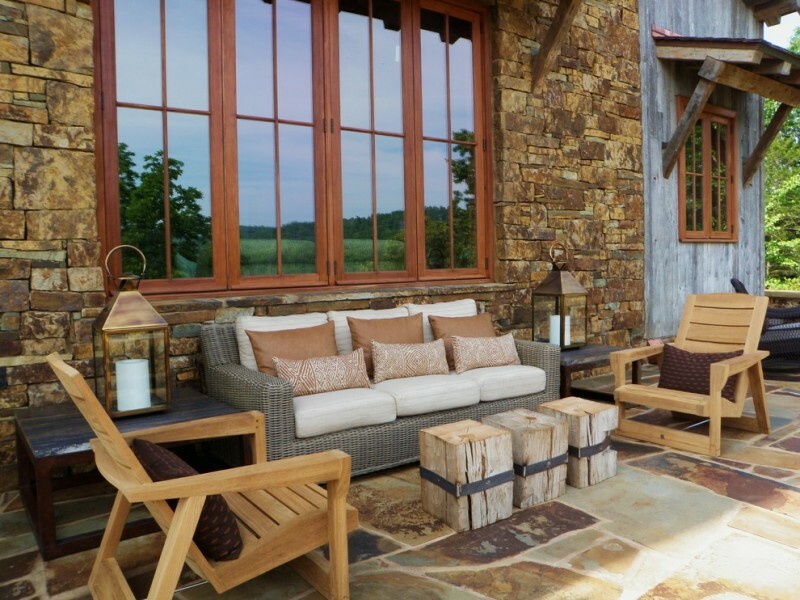 Its simplicity and function make them well-deserved as the part of expensive patio set. Raw tree trunk center table for a backyard patio with fire feature – Look at the table and chairs; they’re designed in totally different style but can complete each other. The fire feature is really interesting sine it’s built like a mini entrance gate with fireplace at its base. 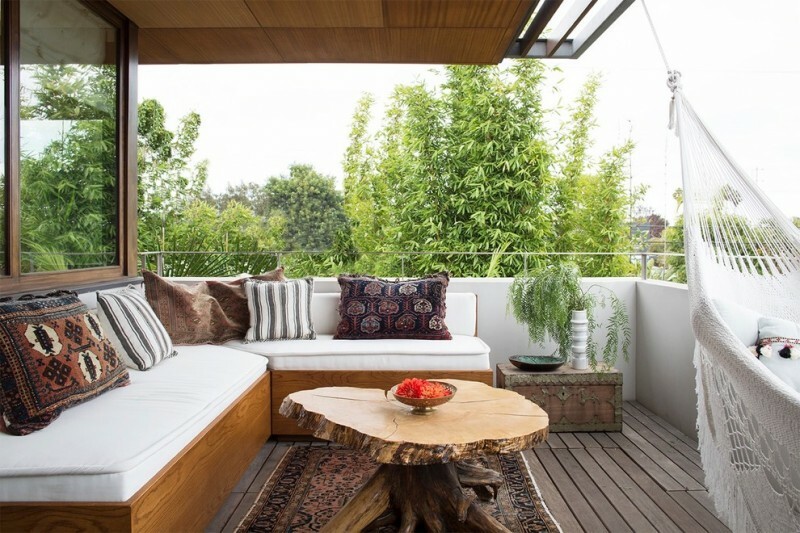 A large outdoor sitting area – The space is complemented with a large sectional sofa, white outdoor chairs made of recycled materials, and salvaged tree trunk tables. 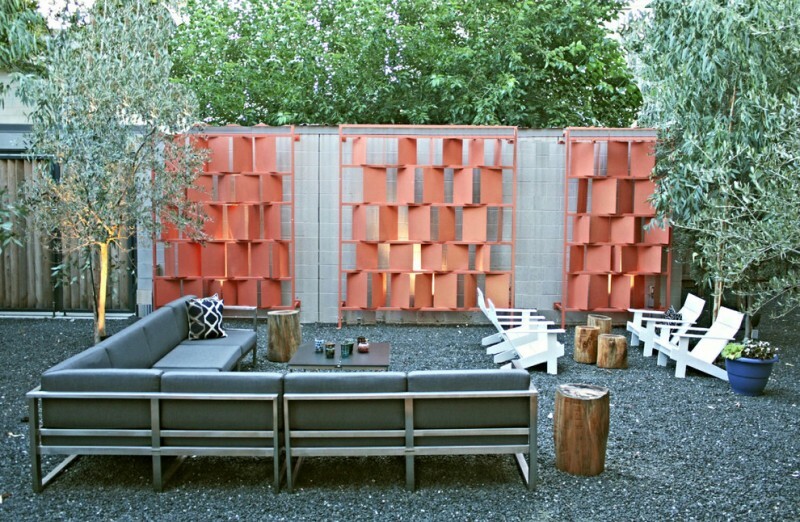 The walls are accented with red shade salmons featuring back lighting fixtures, giving a dramatic look at night. 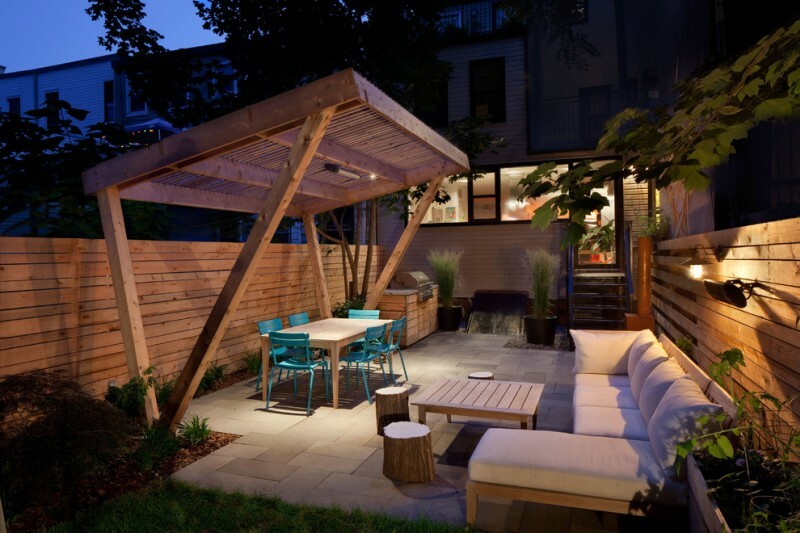 A trendy sitting area in a backyard patio – an inspiring space for relaxing under wooden pergola. 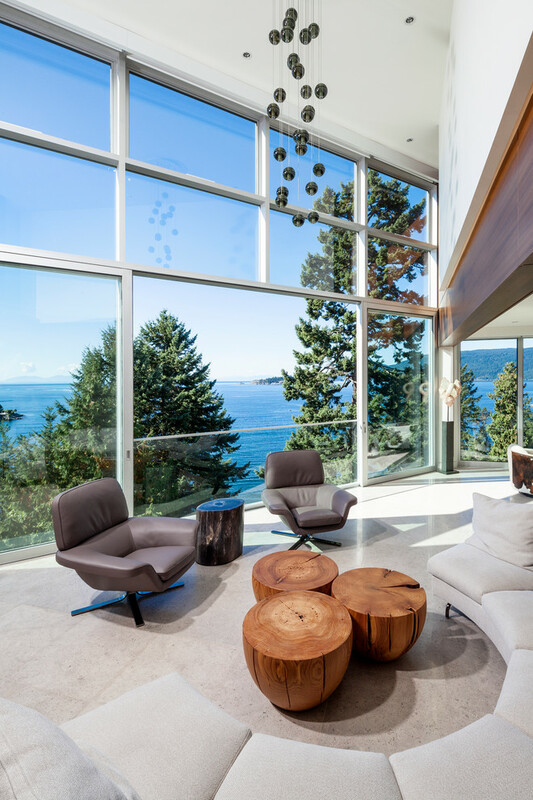 The seating area consists of modern soft beige sectional with a facing chaise and several units of tree trunk tables as stools. The outdoor dining set is flexibly used for a barbecue party. Cozy and so functional, right? Whitewashed tree trunk tables are quite unique and can be used as seats or bar stools like in this Mediterranean patio. It’s better if you choose dominant white seats to give a similar tone. 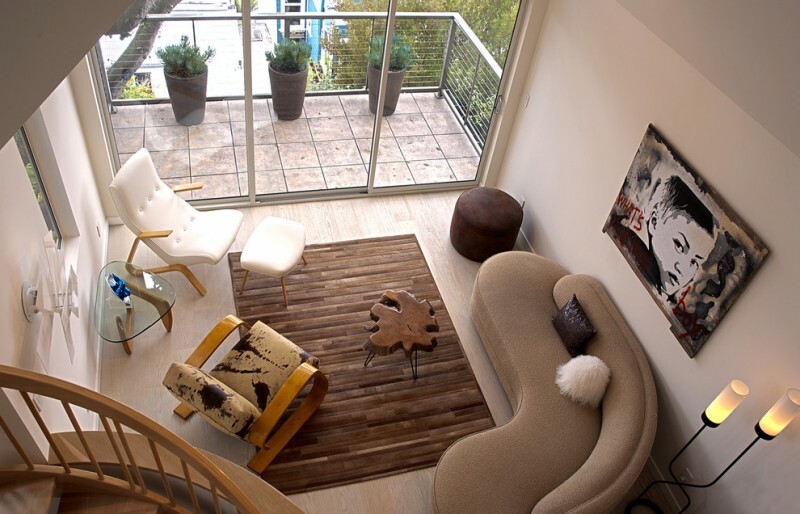 Wood-colored laminating floors give natural appeal to this sitting area. And, notice the ceilings where we’ll easily find the exotic metal beams. It’s a perfect for an outdoor or cookouts purposes. Vintage is chosen for the seats and it works well with dark-toned tree trunk stump used as a table. 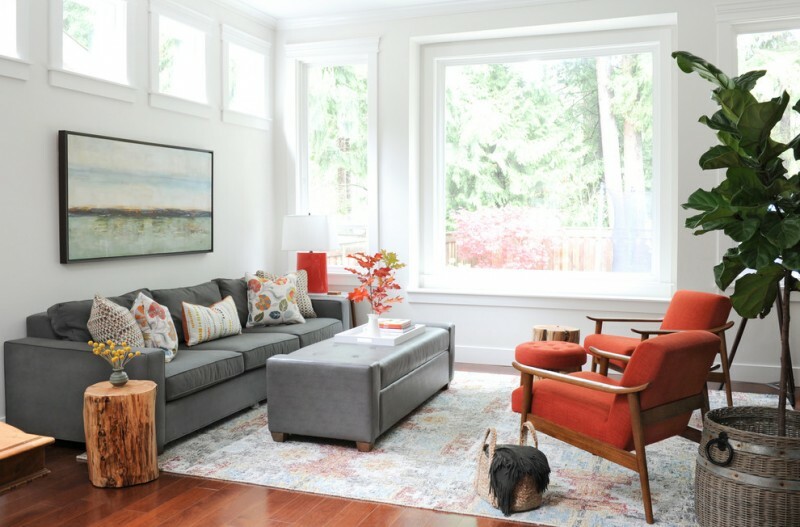 Put something big and stunning in a small living room to create a direct attractiveness. 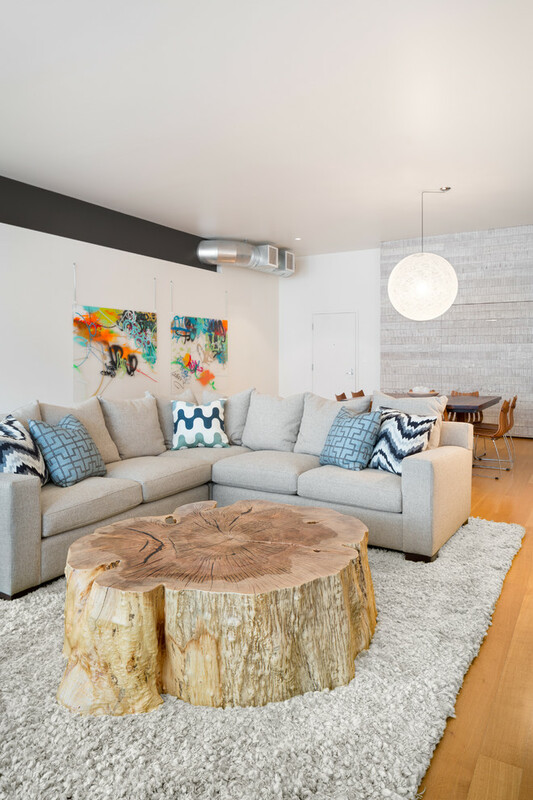 This large tree trunk coffee table, for instance, becomes a focal point that’s easily recognized just by its size, material, texture, and tone. All these values are quite different to other interior pieces, including L-shaped sectional sofa, shag rug, and even wall arts that obviously expose modern look. This large tree trunk stump table is really adorable. It’s gonna be a perfect accent to any rooms including your coziest one like this home library. Its material offers natural texture and tone, giving the most perfect rustic appeal in room. The legs, moreover, which are made of black-finished steels add a beautiful accent to the table. The hairpin shape gives a handmade feel. 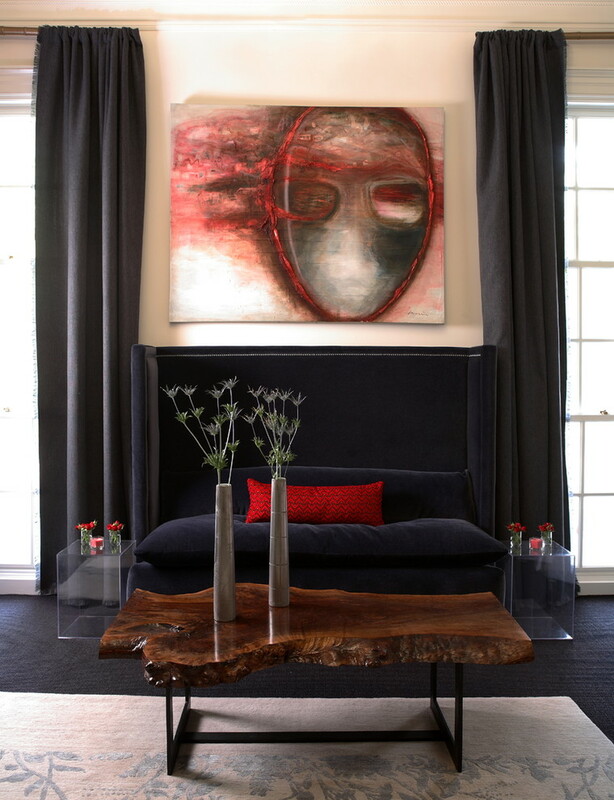 A contemporary living room furnished with a cluster of fabulous tree trunk tables without finishing. Each unit of table is designed in modern style that matches with the main concept of living room itself. Some series of tree trunk tables here have different significant roles and each role is important for the users. The lowest-level one is directed as a simple side table where we can put our fav. books there, and the others are used as the coffee tables that still expose the originality of natural texture and tone of a tree specimen. 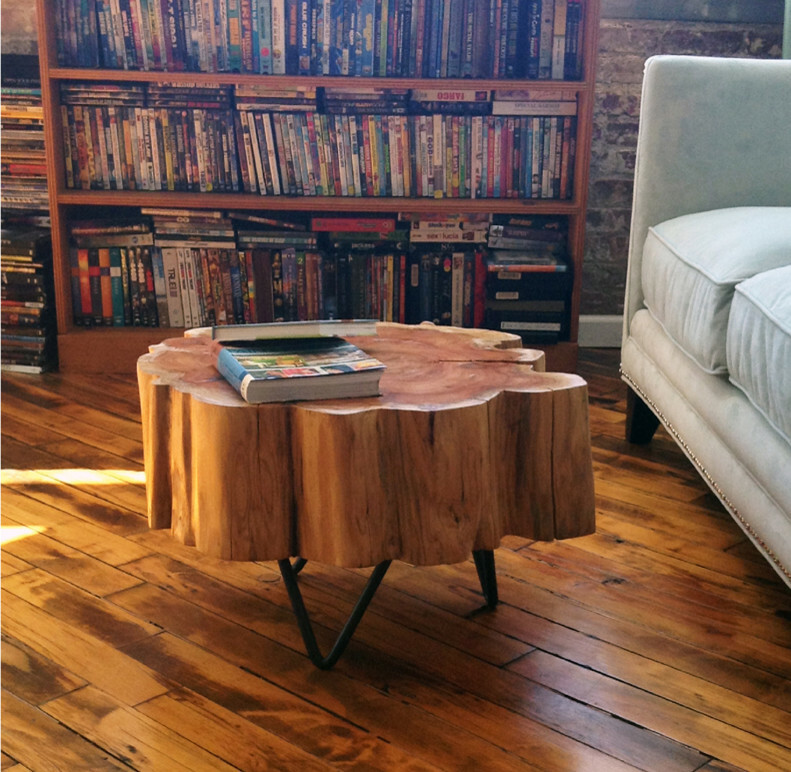 By exposing more the original shape of a tree, we’ve got the best visual of tree trunk coffee table. Perhaps, we just need to cover it with the best clear finishing to protect and to improve its genuine color tone and texture. Give fabric covers to your tree trunk tables is a solution if you want to protect them from dusts or other kinds of dirt. This is also the most instant solution to beautify your lovely tables. You just remove the covers anytime if you want to display the original view of tree trunk tables. It’s so practical. Isn’t it? 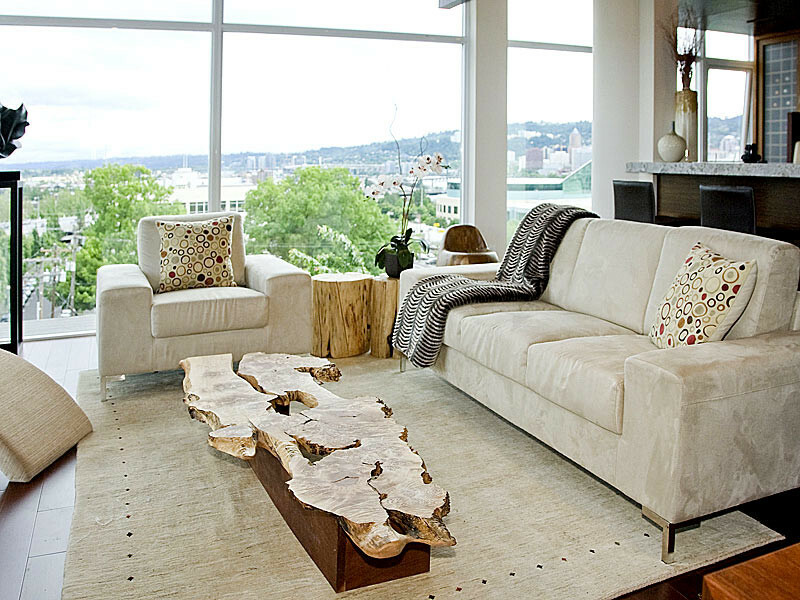 Mix natural element with something modern to create a marvelous masterpiece of tree trunk coffee tables. Tree trunk-cut for the surface and modern-designed wood blocks for the legs – the combination is really unique and can produce an antique and rustic-feel idea. Overall, such idea is called an urban-salvage concept. 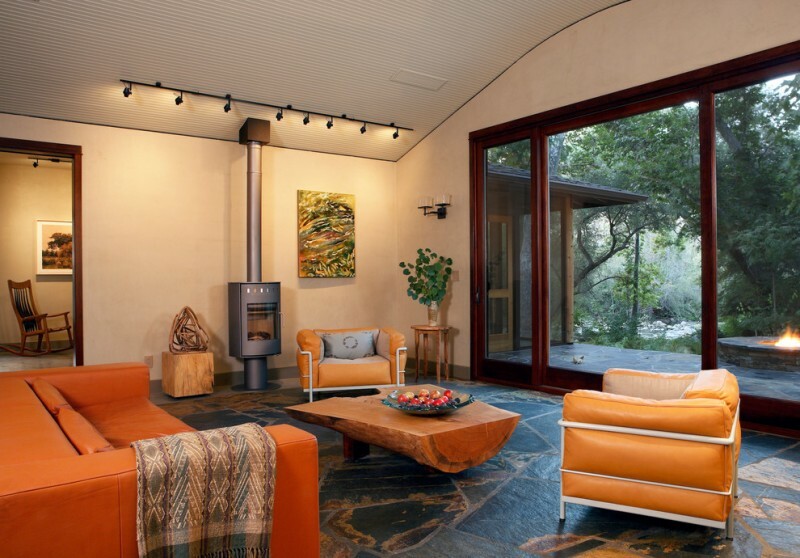 Create the nuance of warmth by displaying wood-made elements to your home interior. 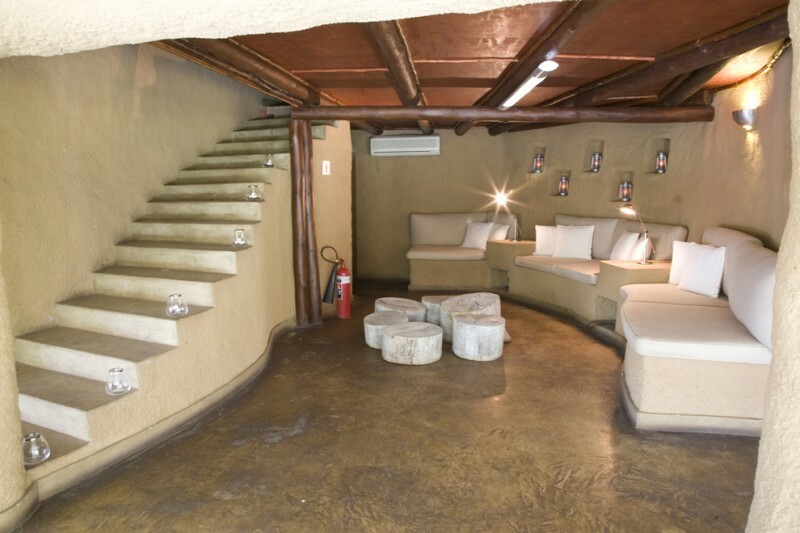 A tree trunk side has completed a cozy chair with its coffee table, providing a cozy spot for sitting under the stairs. 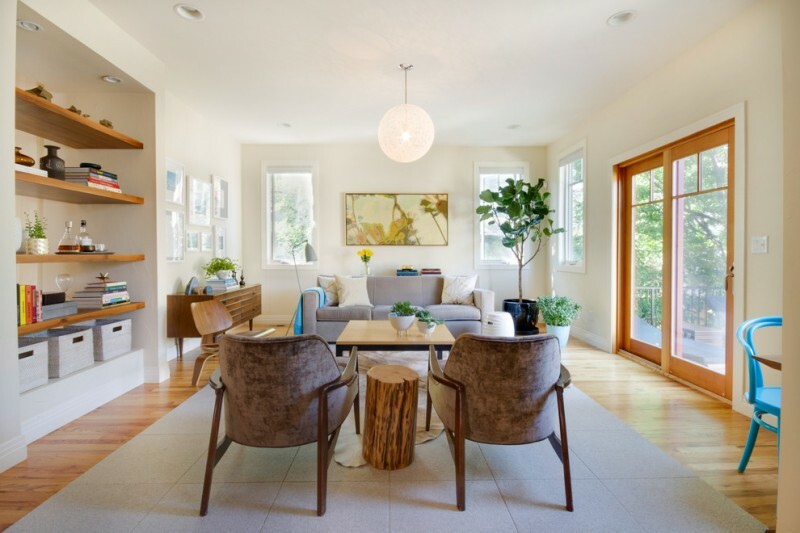 Add the natural element like woods to give something warm in your mix modern-traditional living room. A couple of tree trunk side chairs, for instance, is a good choice in pursuing such goal. 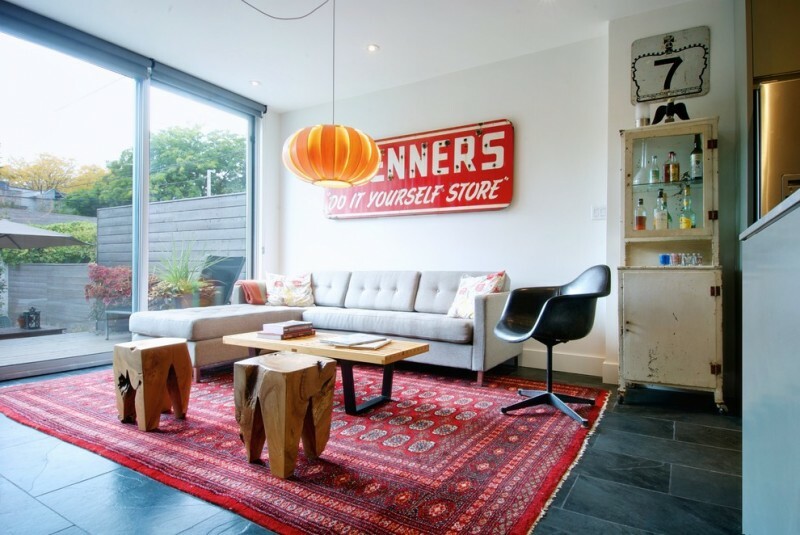 Red Moroccan rug and old wine rack become special focal points here. An outdoor dining table set consisting of elegant industrial chairs and round glass top table supported with artistic tree trunk base. Chairs and table are best match that exposes the greatest work of wood material for the most special drinking wine session. A mid century modern living room with neutral furniture set and playful colored-area rug. Here, the owner wants to show how wonderful Ottoman rug is when it is featured with clean-lines lounge chairs and dark brown sofa. 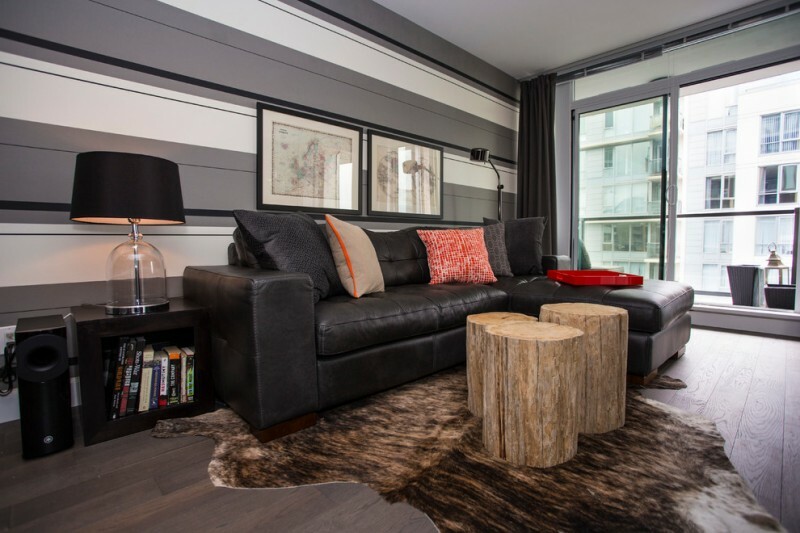 A tree trunk side table here adds similar tone and texture to the floors. Maximize your small living room by furnishing it with single white sectional plus additional chaise. To save the space, set a tree trunk coffee table up and complement it with soft-neutral area rug with floral motifs. 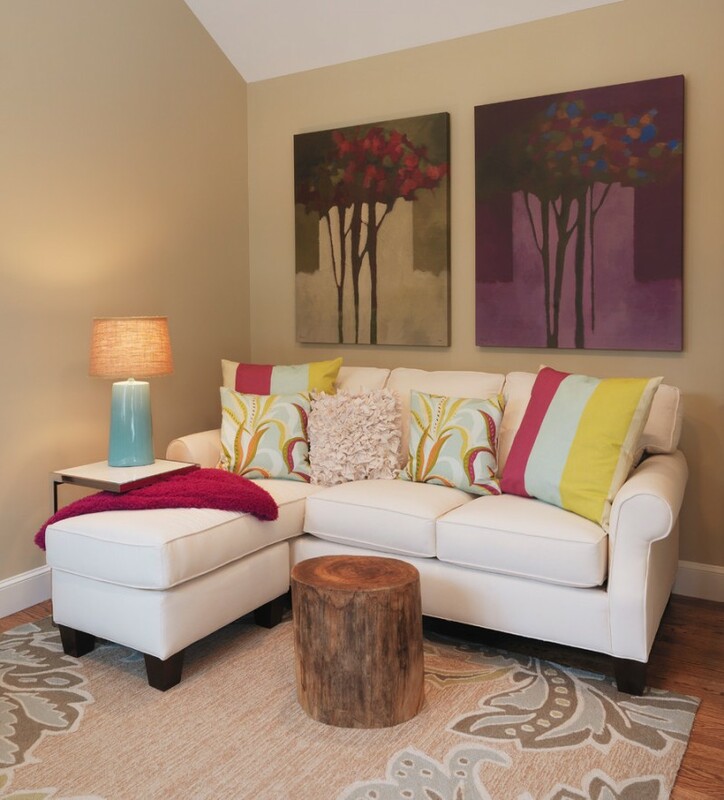 You may add a side table for fitting a small table lamp and some colorful throw pillows as the extra comfort makers. 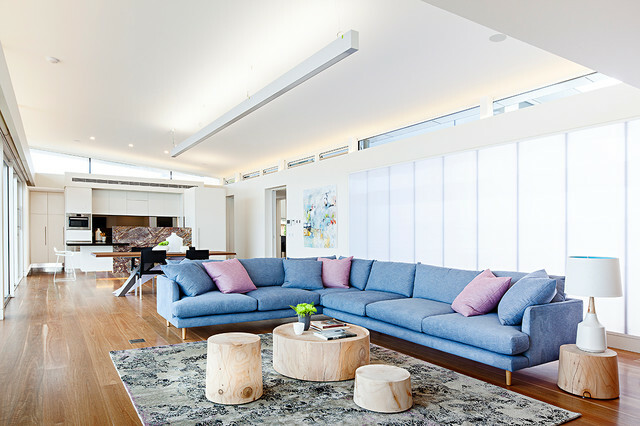 Large and airy-feel – This living room just consists of a dark purple sofa with tufted upholstery, different-level glass side tables, and large tree trunk-top coffee table with stainless steel base. Each furniture item has reflected a strong value either from texture, tone, and shape.